Why Are Recycling & Waste Important? We each produce about 4.4 pounds of garbage a day! Almost half of that can be recycled. Many landfills are rapidly filling up to capacity and are closing forever. Many states, such as New York, transport their garbage as far as Texas because they are unable to manage their waste locally. Incinerating garbage can pollute the air. Contrary to popular belief, ocean dumping is still occurring all over the world. The natural answer is to recycle, but it’s not enough. We can all take steps to reduce the amount of waste we create and protect natural resources. Managing waste is a costly luxury that Americans are fortunate to have. Many places in the world try to unsuccessfully manage their wastes onsite through backyard burning and burial, which results in pollution. The unfortunate part of our curbside collection is that it’s easy to forget about the problem at the curb. When we take out our trash, how many of us ever think about it again? Where does it go? How does it get there? What happens to it? Trash should always be your last option. Remember to first REDUCE, then REUSE, then RECYCLE! According to the government, if every American recycled his or her newspaper just one day a week, we would save about 36 million trees a year. You can save a tree for every four feet of paper you recycle. It takes half as much energy to make recycled newspaper as it takes to make fresh newsprint from trees. The School Board of Broward County's adoption of Environmental Stewardship as part of the 2008-2011 Strategic Plan recognizes the importance and value of recycling. Our stewardship goal is to ensure the District remains a community and national leader in the recycling movement. During the 2008-09 school year, an estimated total of 1,848 tons of recycleable paper, cardboard, and limited amounts of co-mingled metal cans and beverage containers were collected from some 230 schools and school facilities. As reflected in our report, Recyclings Return on Investment, our recycling program saved $802,620 in solid waste disposal costs. Through our interlocal partnership with Broward County Government, recycling dumpsters, classroom bins, and intermediate wheeled containers are provided to assist in the collection of recyclable materials. Broward County Government recently awarded a new contract for recycling services to Choice Environmental Services. This contract is expected to reduce program costs by $699,000. Energy savings benefits of the SBBC's recycling programs can be calculated by inputting tonnage data into models developed by the U.S. Environmental Protection Agency. For example, the 1,848 tons of recyclable materials collected during the 2008-09 School Year resulted in the reduction equivalent of 4,443 tons of carbon dioxide pollution, and also saved 9,223 Mwh; 5,997 barrels of oil; and 29,971 trees. Landfills are a popular way of disposing of trash, and through the years, waste management companies have dramatically improved their environmental footprint. Modern landfills are now properly designed with impermeable landfill liners, which help prevent pollution from leaching into the soil. However, most existing landfills were constructed before this technology and continuously contaminate the surrounding land, water, and air, making people and animals sick. In addition, there is no way to tell if there is a liner leak until the damage has already been done. Repairing liner leaks takes time and costs a lot of money. More importantly, there are too many existing landfills and may people are opposed to more being constructed. Besides the amount of money, land, and time needed for construction, tons of methane is released constantly. Methane is a powerful greenhouse gas that strongly contributes to climate change. Only recently have some landfill operators begun to harness this harmful gas for use as energy. The best alternative to waste disposal is true management. Remember the three magic words: Reduce, Reuse, Recycle. Your wallet has a direct effect on the type of products available in the market. Buying products made from pre and post recycled materials is a key step in supporting recycling programs and resource conservation. Resources are saved only when recycled products are purchased. This is referred to as " closing the loop. " Reduce your consumption. Buy products with less packaging, fix items instead of tossing them, use cloth bags for shopping, and compost. Reuse, sometimes referred to as precycling, can be achieved through simple changes. Some ideas include using a reusable coffee mug, donating items, and reusing packaging and wrapping. The latter makes up one third of our solid waste stream! Recycle. If you can't reduce or reuse, then recycle! Most areas easily recycle aluminum, glass, #1 and #2 plastics, cardboard, and paper. Don’t litter. Ever. Littering is a bad habit. Find out. 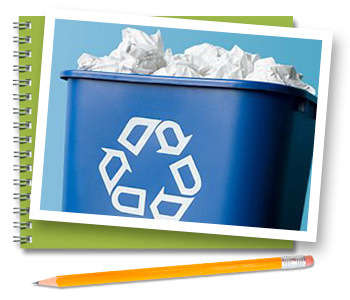 Conduct a waste stream audit at home or in your classroom to identify waste reduction opportunities. Volunteer. Look for opportunities in your community by adopting a road or taking part in the annual Great American Clean Up. Close the loop. Purchase recycled products labeled with either " pre " or " post consumer content " .